William Phillips was many things before he became an economist. The man behind the Phillips Curve was a dairy farmer, crocodile hunter, cinema manager, electrical engineer, member of the Royal Air Force and POW. By the end of WWII he had become so fascinated with sociology through his experiences in the war that he enrolled at the London School of Economics. He eventually was intrigued by the increasingly accepted Keynesian theory that he switched fields to economics. Eleven years later he was a full professor at LSE. Creative and pragmatic in a field typically steeped in academia and theoretical nuance - Phillips became famous for developing the MONIAC in 1949 while still a graduate student at LSE. 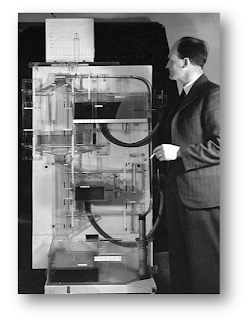 The MONIAC (Monetary National Income Analogue Computer - later referred to as the Phillips Machine) was created using fluidic logic to model the workings of the UK economy at that time. Using his practical experience in engineering, he recreated monetary and fiscal practices in the tangible and manipulative medium of water. He saw that money stocks could be represented as tanks of water, and monetary flows by water circulating round plastic tubes. With a grant of £100 (obtained with Newlyn’s help) he spent the summer of 1949 in a garage in Croydon ‘living on air’ as James Meade was later to put it, working on a hydraulic representation of the Keynesian model. In the machine he constructed, the circular flow of income was represented by water being pumped round a series of clear plastic tubes, with outflows representing savings, taxes and imports, and inflows representing investment, government spending and exports. The model had three tanks representing the stock of money, one for transaction balances and one for foreign-held sterling balances. The whole system determined the level of income, the rate of interest, imports, exports and the exchange to an accuracy (astonishing at the time) of +two per cent. The time path of income and the other variables was traced out by plotter pens making it possible to analyse the quantitative effects of economic policy. Even for a professional trader it's easy to get distracted by the market's manifold of moving parts. You could say it's another example of a Rube Goldberg Machine. Over engineered, inefficient - yet functional. On occasion, components within the apparatus become excessively inefficient and full of friction. The machine goes on functioning for a time, until either the inefficiencies are corrected in-situ or the system breaks down all together. Today, Europe is the zone of friction within the apparatus. The various participants keep coming back to address the audible rattles - but the problem is much greater than the occasional lubrication of liquidity or jawboning from the ECB. It is a design flaw inherent to the great asymmetries of the eurozone itself. Ironically, I'm sure if Milton Friedman and William Phillips were alive today - they would be in agreement to that line of reasoning. Perhaps from different perspectives, but if a Chicago school economist and a Keynesian economist would both agree that the Euro was doomed from the outset - what's left to debate? I just joined Twitter. All my trades and occasional market musings are disclosed in real-time here.